There’s nothing better than a good breakfast burrito that you can wrap your hands and mouth around! Creamy avocado & chipotle yogurt take this healthy one to the next level. 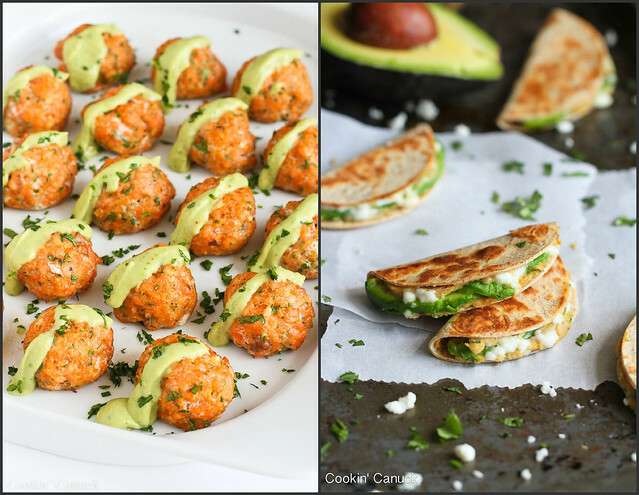 Thanks to the California Avocado Commission for helping me to share this recipe with you. When I first met my husband, I had barely tasted a shredded pork or chicken burrito, let alone a breakfast version. My hometown of Vancouver is not exactly known for its Mexican restaurants. Sushi, curries and fresh salmon – Vancouver’s got you covered. Burritos, enchiladas and tacos – not so much. This didn’t seem like such a big deal, except for the fact that my California-raised husband adores Mexican food of any kind. So, if I was going to feed him plate after plate of stir-fries, rice noodles and spring rolls, then I was going to have throw in the occasional enchilada or taco to keep the peace. Several years ago, my husband traveled to Montana for work and came back raving about “the best breakfast burrito I’ve ever eaten”. Yep, in Montana. I asked him endless questions about what it was filled with and what made it so good. On one of his first Father’s Days, I set to work prepping my first breakfast burrito. I didn’t get it exactly right that first time and it’s evolved over the years. Truth be told, the version that deemed me “the queen of breakfast burritos” is not nearly as healthy as this version. There’s a good amount of cheese, mass quantities of sausage, pan-fried potatoes and an entire ladleful of enchilada sauce for smothering. That’s good stuff for a special occasion, but my waistline can’t handle that kind of indulgence on a regular basis. It was high time to come up with a healthier version! Since California avocados are in season and gorgeously green and creamy right now, it was a no-brainer to tuck a few slices inside of each burrito. Bring on the healthy fats! Avocados are also a great source of vitamins C, E, K, and B-6, as well as riboflavin, magnesium and potassium. If you’re not sure how to cut an avocado, check out my tutorial, How to: Prepare an Avocado. If I’m going to have a burrito for breakfast, I want it packed with good protein, such as eggs and black beans, and veggies to keep me going until lunchtime. Of course, you don’t have to save these for breakfast. They work just as well for lunch or a 20-minute dinner. I know, I know – most breakfast burritos don’t have a lick of yogurt in them. But I couldn’t resist the idea of smearing on a smoky, creamy chipotle sauce for an added kick of flavor. Chipotle peppers in adobo sauce are sold in most supermarkets. If you can’t find them there, they’re available online. You’ll only use one chipotle pepper for this recipe, but the rest won’t go to waste. You could whip up some other recipes, such as Grilled Chicken Tenders with Chipotle Lime Yogurt or Chipotle Guacamole Eggs Benedict. Alternatively, place the peppers on a sheet of wax paper and freeze them. Once frozen, peel them off of the wax paper and store in the freezer in a ziploc freezer bag. Heat the olive oil in a medium skillet set over medium heat. Add the red pepper and cook until just tender, 2 to 3 minutes. Add the black beans and cook for 1 minute. Transfer to a bowl. In a medium bowl, whisk the eggs, egg whites and water. Wipe out the skillet and set over medium heat. Coat lightly with cooking spray and add the eggs. Cook until the eggs are scrambled. Season with salt and pepper. Place tortillas on 2 plates and spread half of the chipotle yogurt on each tortilla. Spoon half of black bean mixture down the center of each tortilla, leaving room at each end. 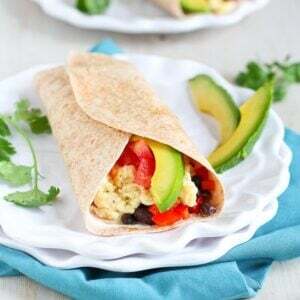 Divide the scrambled eggs, tomato and avocado evenly between the 2 tortillas. Fold in the ends of the tortillas, then roll each to form burritos. Serve. In a small bowl, stir together the yogurt, chipotle pepper, adobo sauce and salt. Disclosure: I am honored to be a brand ambassador for the California Avocado Commission. All opinions are my own. This post contains links to my Amazon affiliate page. Any revenue made from sales through these links helps to support this blog. Thank you! I 100% relate to this! Considering I also grew up eating the amazing Vancouver Sushi, when I met my American Husband he was appalled at the lack of burrito-ness. Then he introduced me to the breakfast burrito, and life has never been the same. I am LOVING your version…and that chipotle yogurt? DELISH. Pinned! 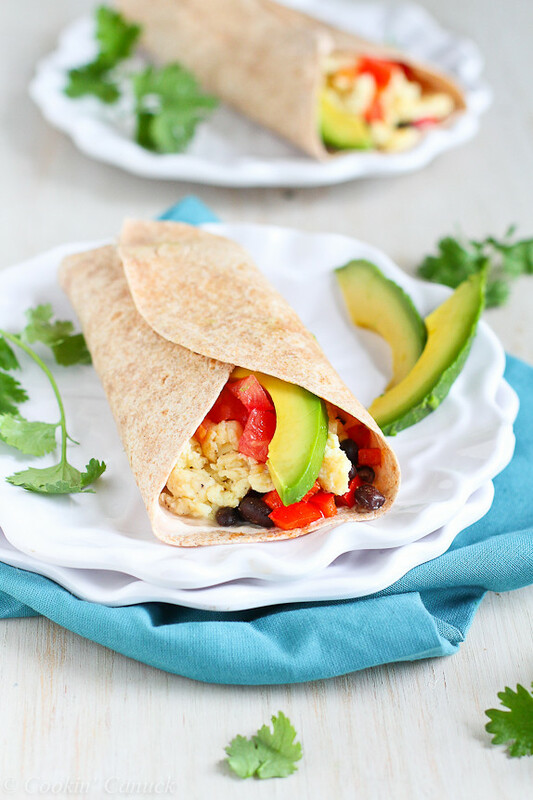 Love these healthy protein packed breakfast wraps – great anytime I agree! 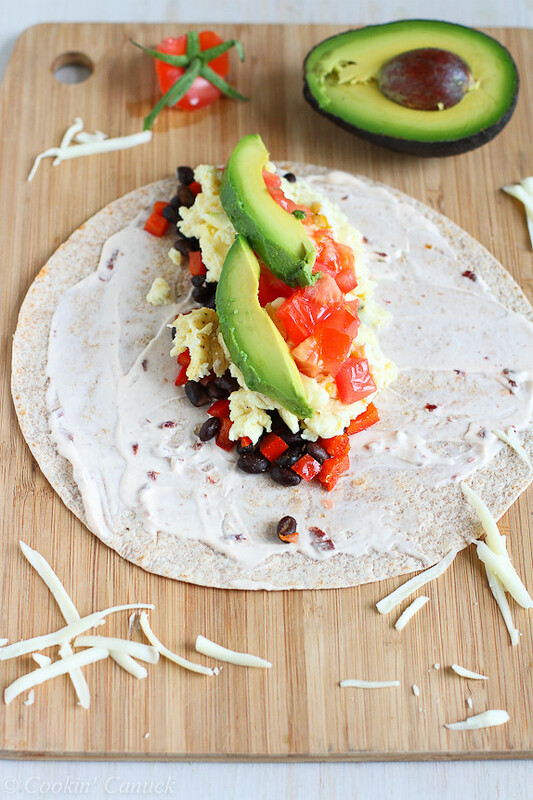 Beautiful breakfast wrap! Love this healthy choice! You’re speaking my love language with these beauties!!! I’m so excited for avocado season!! The perfect breakfast! We are in the process of packing and moving, I will be making these a lot, so good. I absolutely LOVE breakfast burritos! And avocados! I grew up in AZ where Mexican food was abundant. Moving to BC was difficult because there were hardly any Mexican restaurants or food available in stores. But homemade is better. Love these! This is the kind of hearty breakfast that my boys love! I could seriously eat avocados at every meal, every day, so delicious. Adding avocado to anything makes me drool! These look perfect for the on the go family like mine!! breakfast burritos are fantastic and I’m always looking for new ideas and foods to fill them with! Great healthy version too! I’m not sure how well it works with whole wheat tortillas but regular flour and corn tortillas are a million times better heated before being used. Place the tortillas in a dry (no oil) skillet over medium heat and cook them for about 30 seconds on each side. Or if you have a gas stove top char the tortillas directly over the gas flames for a few seconds using tongs! It’s SO good!! Boy, does this look like one scrumptious breakfast! Love avocados!!! My husband also grew up in CA and I grew up in TX so we both love Mexican food. . love love love California avocados and this breakfast burrito!!! yum! Now that’s what I call a breakfast burrito! Full of protein and healthy fat from the avocado. Yum! 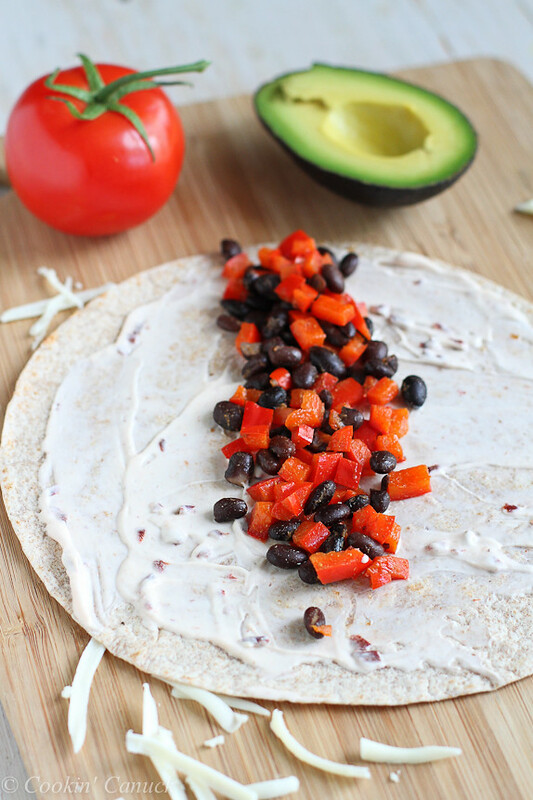 Not only are these burritos pretty they look delicious! The addition of creamy avocado has me sold! Love this healthy breakfast! I totally need to branch out and try something like this. Any excuse to put avocados in my breakfast! This is burrito is a reason to wake up in the morning. 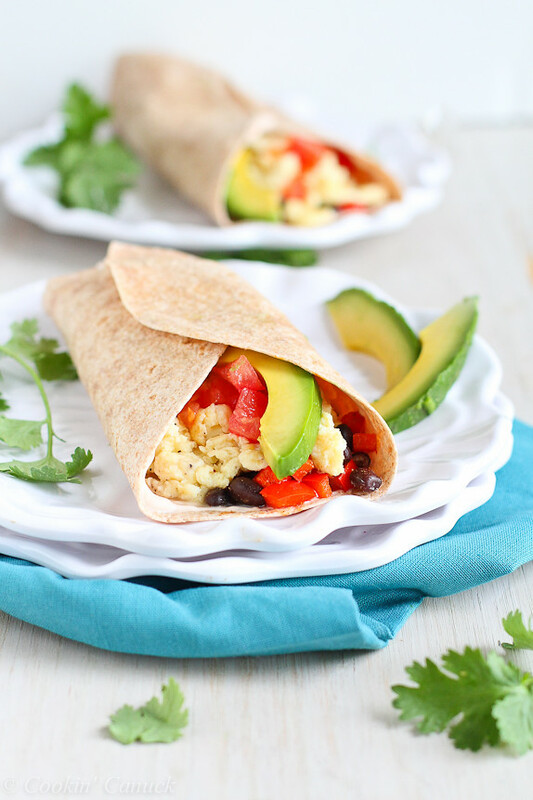 I’m not a huge breakfast person, but I can totally get behind these burritos to start my morning off right! THIS burrito = Perfection! Love everything about it Dara! We made these over the weekend and they were fabulous! Delicious! The recipe was easy to follow, just a few ingredients, and so flavorful. It’s a keeper! Thanks, Sarah! I’m so glad you enjoyed it.